Whether you drink tea for pleasure, out of habit or with a health benefit in mind, it is always best to know a little about the type of plant infusing in your cup, more exactly about the ailments it can help manage or treat. 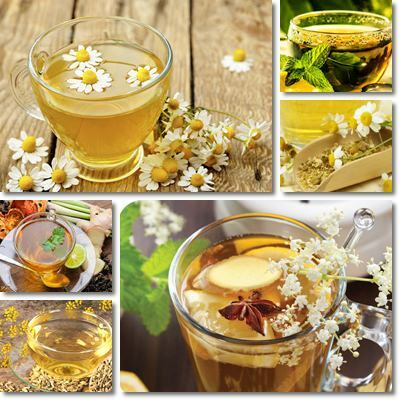 Herbal infusions, commonly known as tea, are quite beneficial for one’s health when consumed on a regular basis. Each plant you infuse in hot water possesses certain health benefits, but may not be devoid of health risks. Knowing what herbal remedy is good for what can make a great difference for your health and help you treat or manage conditions ranging from constipation, anxiety, stress and insomnia to hypertension, high blood cholesterol, nausea, diarrhea, bloating and the common cold. So what tea should you drink? 1) Elderflower and echinacea for colds and flu. Infusing ederflower or elderberry flowers is said to help relieve nasal congestion (stuffy nose), reduce inflammation, alleviate cough and increase perspiration, reducing fever associated both with the flu and the common cold. Echinacea is an excellent immunity booster, stimulating our immune system to become more aggressive and efficient towards pathogens and was shown to significantly reduce the incidence of respiratory tract infections such as the common cold, flu, sinusitis and bronchitis. 2) Licorice, senna leaf and fennel seeds for constipation. Drinking 1-3 cups of licorice, senna leaf or fennel seeds tea a day can help improve your bowel function almost immediately and treat constipation in a matter of days. But while licorice and fennel seeds tea may be used for up to several weeks, senna leaf infusions are to be consumed with greater care since they boast strong laxative properties. A combination of senna leaf, fennel seeds and licorice can also make an efficient constipation remedy and a great solution for hemorrhoids. Also see what foods to eat and to avoid for hemorrhoids. Dandelion tea is also a good choice if you are suffering from constipation. 3) Peppermint and chamomile for diarrhea. Peppermint is by far the best anti-diarrhea plant you can think of. Not only does it help combat loose stools, but it also acts as a local anti-inflammatory, antispasmodic and disinfectant, as well as prevents fermentation that may be causing loose stools. While chamomile does not treat diarrhea itself, it does help stop spasms and calm inflammation and thus contribute to a faster recovery. Remember, however, that herbal infusions are a secondary diarrhea treatment and the condition should always be approached with extreme care by consulting a medical professional, improving sanitation and changing diet. Also see what to eat when you have diarrhea. 4) Ginger and peppermint for nausea. While antiemetic medication might be your first choice, know that ginger tea as well as peppermint tea are natural antiemetics and thus quite efficient at relieving nausea and vomiting sensations. Ginger, for example, is even recommended for the treatment of nausea brought on by pregnancy as well as chemotherapy. 5) Fennel seeds, ginger and cumin tea for bloating. Fennel seeds as well as the tea made from them can help relieve bloating sensations associated especially with indigestion. Ginger and cumin infusions are both quite efficient against bloating as well. However, anyone with existing gastrointestinal conditions such as acid reflux disease or gastritis should avoid adding raw ginger to their tea as it can worsen symptoms. See 7 Reasons Not to Eat Ginger. 6) Lemon balm, chamomile, lavender and linden for stress, anxiety and insomnia. If you are constantly stressed and it is starting to affect your life by causing anxiety and sleep disorders, then you might want to consider drinking a small to moderate cup of warm tea. The best choices are chamomile, lavender, linden and lemon balm, four plants with mild sedative and calming properties, which promote relaxation and help induce sleep. Lemon balm especially increases calmness by relaxing the nervous system. 7) Valerian and St John’s Wort for anxiety and depression. Both valerian and St John’s wort herbal infusions are extremely potent natural nerve tonics. Valerian root is excellent against anxiety, insomnia, fatigue, migraines, stress, mental restlessness and depression, while St John’s wort increases serotonin levels in the same way as antidepressant medication, competing with the latter as an all-powerful, natural treatment for both mild and severe depression (see these 9 Surprisingly Effective Anti-Anxiety Herbal Remedies). These two plants have such an incredible effect on the nervous system that they can replace regular medication, provided they are taken under the careful supervision of a medical professional. 8) Rose hip and hawthorn for hypertension. Rose hip is an excellent diuretic, anti-inflammatory and antioxidant that helps reduce high blood pressure and maintain blood vessel integrity. Hawthorn is famous for its vasodilating properties which recommend it for the treatment of high blood pressure and other cardiac conditions brought upon by stress (palpitations, extrasystoles). 9) Green tea, black tea and white tea for slow metabolism, fatigue and sleepiness. All three contain their fair share of caffeine, hence their metabolism boosting effects and energizing action. Generally, green tea has less caffeine than black tea, but there are many variables that can influence caffeine content. Different brands contain different caffeine levels, but steeping time can also influence caffeine content (the longer you infuse green tea, the higher its caffeine content is said to be). For more information on the medicinal herbs, feel free to check our herbs and spices page. Conclusion: When consumed in the right amounts, teas can have great benefits for our health and can sometimes potentiate or even replace some non-essential conventional medication. However, remember that health is not to be taken lightly so please consult with your doctor before switching to any other form of treatment than the one you might be currently under. Also, remember that tea herbs are a potential source of allergic reactions and that herbal infusions high in caffeine, such as green, black or white tea, are to be avoided in hot weather, especially when heatwaves hit in summertime because they hold the potential to dehydrate, accentuating the health risks associated with high temperatures.